Hybrid Perpetual. ‘Lord Raglan’ has large and full, velvety, scarlet-crimson flowers, edged with violet-crimson. A vigorous grower, its flowers were described as somewhat small, but brilliant and so free that it has 6 or 8 flowers on a truss. [Paul (1863, 1888), Rivers (1857, 1863)]. Introduced by Guillot Pére in 1854. According to Paul Ricault, writing in the Gardeners' Chronicle in 1860, ‘Lord Raglan’ ‘kept his place with great dignity, but he wears a different dress in England from what he does in Scotland, being scarlet in the former country and purple in the latter’. It was reportedly raised from seeds saved from ‘Géant des Batailles’, its flowers described as higher coloured and even more dazzling than this famous rose. 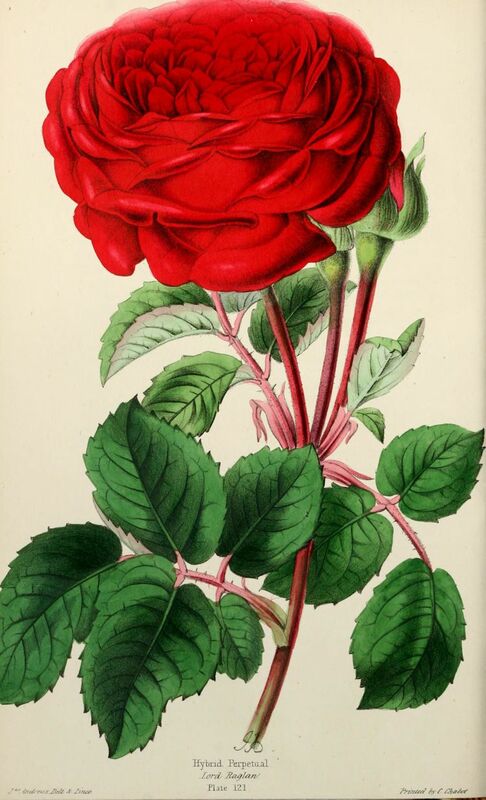 In the first great National Rose show held in July 1858, ‘Lord Raglan’ was listed amongst the roses appearing in multiple (12) winning collections. [Gard. Chron. 1858]. William Paul included ‘Lord Raglan’ among his ‘best twelve’ roses at the beginning of the Wars of the Roses in 1856 [Gard. Chron. 1856], and Louis van Houtte included it in an Énumération des plus belles variétiés et….des autres!, all Hybrid Perpetuals, in the Flore des Serres. [FS pgs.91-102 vol.15/1864].